We're less than a month away from one of the most highly-anticipated golf events in a long time. On November 23rd in Las Vegas, Tiger Woods and Phil Mickelson will go head-to-head on the golf course with the winner taking home $9 million. Tiger and Phil are two of the greatest golfers the sport has ever seen and this head-to-head format has fans ever more excited for their matchup. Before they do battle in Vegas, though, the two did battle in a different kind of game, golf pong, and it came down to the wire. 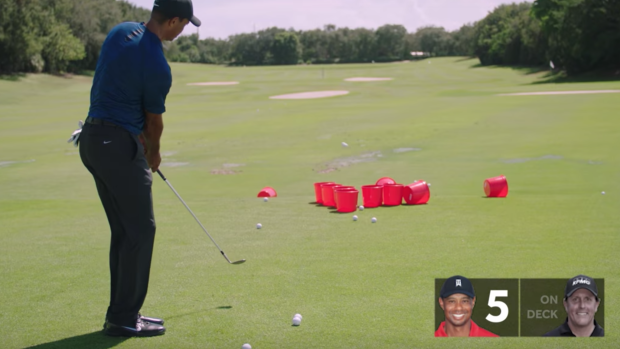 The lefty battled through some adversity (the buckets not being upright) to beat Tiger by one shot and it looked like they had a lot of fun in the mini competition. Hopefully this game is a sign of things to come for the actual event that will take place in just over two weeks because we'd love nothing more than for it to come down to the 18th hole.